The Gluten Free Cosmopolitan – Gluten Free Living. Globally. Dining out can always be a struggle when you have a dietary restriction. Moving to (or just visiting!) a new city tends to lend itself to a growing anxiety about what you can or can’t eat, where you can go to eat safely, and where restaurants and staff are considerate and accommodating of restrictions. Here’s my rundown of my all-time favorite GF-friendly spots in Denver, Colorado! Feel free leave a note in the comments section if you have any other favorites that you think should be included! Olive & Finch is a totally underrated breakfast and lunch spot located in Cherry Creek, Denver (a great spot for a post-shopping refuel)! With cozy decor and a casual-but-friendly approach to service, Olive & Finch has some amazing selections for breakfast or brunch. They also have amazing gluten free pastries — I would highly recommend the Cinnamon Cream Coffee Cake. It is absolutely to die for, but it often sells out early, so make sure you get in early if you want to snag a sweet treat! My go-to meal is always the Henhouse Scramble, which comes with two scrambled eggs, black forest ham, sautéed mushrooms, red onions, parsley and cheddar cheese, served with a green salad, roasted potatoes and toast (gluten free on demand). O&F offers many vegetarian and dairy free options, too, so be sure to put it on the list for lunch! Oh, Snooze. The lines at Snooze are unfailingly long once you hit about 9:30 — 10:00 AM, but this spot is worth the wait. Snooze has a lot of delicious breakfast options, but I wont lie to you: I’m really, really in it for the pancakes. They do pancakes by the stack or by the single pancake, and I’m a particular fan of the cinnamon roll pancake and the peanut putter and chocolate pancake. I have a major sweet tooth, so this is probably no surprise, but there are tons of other GF-friendly items here. Be sure to ask for it gluten free, but don’t be surprised if it comes out looking fluffier than you expected! These pancakes will be so good you won’t even be able to tell the difference. I have only three words for Postino: Bottles. And. Bruschetta. And a great bargain if you head over there on a Monday or Tuesday evening after 8:00 PM. Postino has killer gluten free bruschetta boards (you get to pick four different types of bruschetta), and during their Monday/Tuesday evening specials, you get a whole bottle of exceptional wine and a bruschetta board for $20. A total steal, I HIGHLY recommend Postino to anyone who loves wine and great eats. This is easily one of my top spots in town, and this deal is totally unmissable. Acorn holds a special place in my heart when it comes to eating well in Denver. I had the immense pleasure of working here for a while while living in Denver, and boy can I tell you, the food here is hands down some of the best you will ever eat. Staff are given an incredibly thorough allergen training, and while Acorn does not offer gluten free bread/toast, they make up for it with high-quality ingredients and innovative dishes. Many dishes can be altered to be made gluten free, and although their menu changes seasonally, at the time of writing a few must-orders are: the Waygu beef tartare, the chicken (without the bread pudding), the 24 ounce ribeye, the kale and apple salad, the barbecue baby carrots. Root Down is one of the original restaurants of the Edible Beats restaurant group, founded by chef Justin Cucci. There are tons of gluten free items here, and there is a designated GF, unshared fryer. Root Down is especially cognizant of dietary restrictions and allergies, and uses allergen markers to designate gluten, nut and dairy allergies, and also additional restrictions, such as vegetarian/vegan. I have a personal love affair with the Lamb Sliders, which are also available during happy hour! Another of Justin Cucci’s masterpieces, El Five is a great spot for some Mediterranean delights with an unbelievable view of the city. Not to be missed here is the housemade soft cheese and the charred baba ghanoush. GF items are marked clearly on the menu! With the quirky backdrop of modern-day speakeasy and amazing craft cocktails, Williams & Graham is a hugely attractive spot for beverages and bites in Denver. While W&G doesn’t have a huge number of gluten free options, they deserve an honorable mention for their gluten free burger and buns. Be sure to order without the gastrique on the fries, as there’s malt vinegar in that particular sauce, but the garlic aioli is absolutely not to be missed. Seasonal beers. I can’t tell you how many times I’ve exhaled a sad sigh while passing a fruity blueberry or raspberry beer in summer, and more painfully pumpkin beers in autumn. Seasonal beers are one of the great joys in this cold, hard world, and I thought I was going to be without them for a long, long time. Although I’ve yet to find a gluten free pumpkin beer (if any of my amazing readers know of one, PLEASE leave suggestions in the comments! ), I have managed to find a 100% gluten free (read: celiac-friendly) raspberry ale just in time for summer. Denver weather has been fickle for the last few weeks, but today it was a balmy 71 degrees fahrenheit and perfect weather to crack open a brew with dinner. I bought a six pack of the New Planet Raspberry Ale a few days back and finally have had the chance to pop one open! 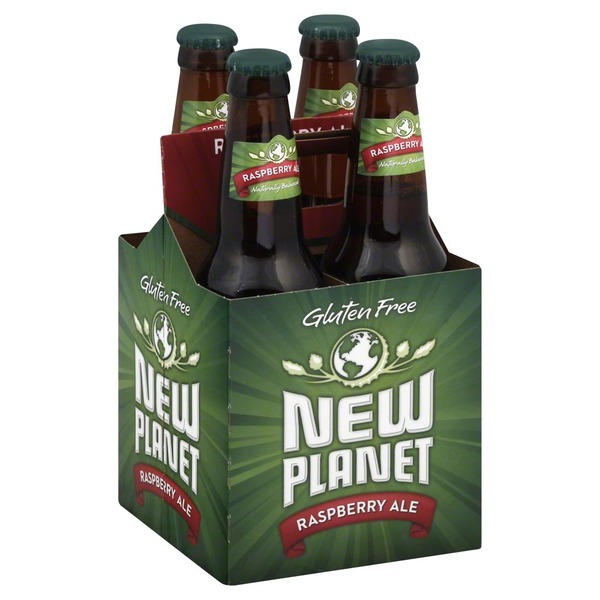 The New Planet Raspberry Ale is brewed from brown rice extract and sorghum, but it doesn’t have the off-ish taste that many sorghum beers have. It’s also surprisingly dry for a fruited beer, with the first mouthful is very lightly hoppy and the malty flavors being fairly prominent. Raspberry and a hint of orange follow almost as an aftertaste, which might be offputting to some looking for a sweeter, fruit-forward beer. That said, this definitely drinks well, with a great balance of hops and a soft, fruity maltiness that leaves this ale neither too bitter nor too sweet on the palate. The verdict? This is a great summer brew, but having gotten through a few of them now I think they would be fairly difficult to drink more than one of in one sitting. The New Planet Raspberry Ale is rich and filling, and although it’s generally refreshing, there’s also a quality of heaviness to it that makes it delightfully drinkable, but not exactly as crushable as other beers out there. This beer is a great post-work, pre-dinner, summer-y treat, but if you’re looking for a beer that you could drink (responsibly) multiple of, you may want to keep looking. This is the quintessential summer beer! Raspberry and citrus notes make this beer super refreshing after a long day. Price — this beer is particularly affordable, at least at my local shop. A little heavy and so rich that its hard to drink more than one (but maybe I just need to up my game!). Not as well rounded as other beers, like the Daura or the Omission lager. Some of the strong flavors compete for attention in this beer rather than working together. I recently wrote a post on gluten reduced vs gluten free beers, and have since started exploring more gluten free beer options! While I’m still planning on making a trip out to the totally gluten free Holidaily Brewery, I managed to find a few great starting options at my local liquor store. I already had some foundation with the Daura Damm Lager, and wanted to branch out and see how the other gluten reduced lagers out there stacked up. Omission’s lager was the first one I managed to find, and I was very excited to crack one open on one of my few days off this week. The weather was definitely lager weather, too; it was in the high sixties today, with a heady golden sunset that seemed to scream out for a nice, refreshing beer. So did Omission live up to my expectations? In summary, yes. Omission’s lager is a malty, vaguely velvety beer, low on carbonation and very rich. Served cold from the fridge, my Omission was great from the first sip, with a flavor profile that I love in a lager. Flavor-wise I’d say it drinks similarly to the Daura, but there was a little more flatness and a much fuller body. I drank my Omission from a wine glass (shh, don’t tell) and it was a vibrant golden color that almost matched the sunset I enjoyed while indulging. So what was really great about this beer? Definitely the richness. It had an almost creamy quality to it, in spite of the fact that it’s very far from a milk stout, and was definitely soft and incredibly smooth on the palette. In terms of drinkability, I think this beer was right about at a ten out of ten; it wouldn’t be hard to put back a few of them in an evening without even realizing it. There’s absolutely no bitterness to this brew, and there’s a slightly sweet aftertaste that hits the palette right at the end of each mouthful. Was there anything I didn’t love? Yes, but not much. For starters, I think that this lager was lacking a little bit of the crispness I was really craving. Maybe it was the lack of carbonation, but this beer definitely could have had a slightly sharper edge to it. While the flavor profile of this beer was almost perfection, I really would have loved a little more bang for my beer-drinking buck in terms of crispness and refreshingness. Overall, this is definitely a solid gluten-reduced beer choice. I look forward to finishing off the rest of the six pack in the days to come! As a person who discovered her gluten intolerance in her mid-20’s, I had definitely already fallen in love with a lot of gluten-ful products during my lifetime. Some of which I don’t miss all that much — pasta is one of those foods I surprisingly almost never crave — but others that I periodically miss a lot. Bagels, sourdough bread, great from-the-box cupcakes…I still miss them all, and haven’t found replacements for a lot of them. On my never-ending hunt for great gluten free treats, I found the Katz line of products. I haven’t managed to try all of them as they carry a fairly steep price tag (about $6.50 per box of 6 doughnuts), but I can give a tried-and-true review of their glazed products. Watch this space for more reviews later — I would love to try their chocolate glazed doughnuts to see what they’re like! So overall these doughnuts do what they should. If you’re looking for something Krispy Kreme-y, keep looking. These doughnuts firmly fall into the cakey category, which is great for a Sunday morning with a big cup of English Breakfast tea or a coffee. They’re satisfying, dense and delicious, and if you’ve been wanting some cakey doughnuts for a while, then look no further! These doughnuts have the advantage of actually tasting like doughnuts are supposed to taste. They don’t have a weird aftertaste, they don’t taste strangely metallic, and they have just enough glaze on them to make them sweet and satisfying, but not cloying. Overall, I think they make for a great little treat, but they do have some downsides, too. Although the taste is spot-on, they do run a little dry (sigh), and more importantly have a weird mouth-texture to them. They leave a little bit of a thin, vaguely aspartame-y film in the mouth which, while not delightful, is definitely tolerable. Would I buy this product again? Yes! I definitely want to try their other flavors, too, and will write a review ASAP once I do. Even though we’re stretching our claws into spring, Denver has had a few lingering, chilly days that remind me that it is still firmly winter for another few weeks. And what better way to take advantage of winter weather than to enjoy some oven-baked, mapley, gooey-in-a-good-way maple mashed sweet potatoes? There isn’t one, I promise. These are one of my favorite go-to side dishes, partly because they taste and sound like they’re far more complex than they really are. These aren’t exactly healthy, but they are rich, buttery, creamy and delicate in spite of the fact that they could err on the side of heavy. The richness of the potatoes paired with the natural sweetness of the maple syrup and the balancing lipidity of the heavy cream and butter make this an incredibly satisfying side dish, and one that you’ll want to eat all year round. I served these tonight to go with my figgy balsamic and rosemary pork tenderloin, but they really go well with most lighter meats, especially roasted chicken. I also love them all on their own — its like cheating and getting to eat dessert first, but also with vegetables. And heavy cream, butter and maple syrup, but who’s counting? Sometimes you need food that will nourish your soul rather than your trim waistline, and that’s OK. (This is also how I feel about poutine. I use this to justify probably too much in life, but do as I say, not as I do). 1) Preheat oven to 400 degrees fahrenheit. Wash potatoes, then place on foil-covered baking sheet and bake for approximately 40 minutes, until the potatoes are soft and pierceable with a fork. 2) Approximately 5 minutes before removing potatoes from oven, add butter and heavy whipping cream to a small saucepan and heat over low heat. Once mixture is heated through and all butter has melted, add the maple syrup. 3) Heat until bubbling and well-combined, stirring occasionally. 4) Remove potatoes from oven and allow to cool for several minutes. Peel and add to a large mixing bowl. Mash very slightly with a fork until potatoes are flattened, but chunky and not totally mashed. 5) Slowly add half & half/butter/maple syrup mixture to the potatoes, mashing as you go. Continue adding until potatoes become creamy, but not too liquid. (Hint: taste testing is the best route here. You won’t regret it). 6) If potatoes aren’t as sweet as you would like, add more maple syrup, a few teaspoons at a time. Sprinkle with salt and pepper and give a final, thorough mashing. 7) Serve with your favorite mains! This dish is great because it can be prepared in advance, and it keeps well in the fridge. Recently, I took a trip to the UK to visit universities for the fall. As most trips to the UK tend to do, we started in London, giving ourselves a little bit of time to get acclimated to the time change in a familiar city. Based in Waterloo, we were faced with a few challenges when it came to finding me food that I could eat; my mom is not gluten free, and therefore gets to enjoy a wealth of food options that are off-limits to me. Our hotel was perfectly located next to a few supermarkets and had a little kitchenette, which came in handy so that we didn’t have to pay through the nose for pricey London breakfasts. But that didn’t help us with lunch or dinner, so I’ve put together a small list of London locations that offer gluten free options for brunch, lunch, tea and dinner! I’ll be featuring restaurants I can give a genuine review of near the top of each category in which they’re listed, and suggestions for restaurants that I haven’t tried but know have gluten free options near the bottom of each category. Restaurants I haven’t eaten at are listed in italics. I’ve also included a few great places to eat at or near tourist attractions to help all my fellow GF world travelers find a quick bite to eat on location! Duck & Waffle: A beautiful, top-floor restaurant overlooking the city, Duck & Waffle has food that is as spectacular as their views. They even do a gluten free Duck & Waffle — their signature dish. I believe they do have a shared fryer, but they have many gluten free options for you to choose from, and can edit menu items to suit your dietary restrictions. Their beef tartare is amazing, as are their bacon wrapped dates. Balance: A great little breakfast spot in Waterloo, Balance offers gluten free pancakes and occasionally also has gluten free bread and toast. I had the energy pancakes and the protein pancakes, both of which came in sizable portions, and tried the beet salad with feta cheese, which was also very fresh and tasty. Crust Bros Pizza: Crust Bros makes a pretty decent gluten free crust. Cross-contamination is definitely a concern here, but the actual gluten free crust is tasty, if a little bit on the limper side. The ingredients are all very fresh, and the pizza is totally customizable. Watch out for the n’duja sausage — it is not gluten free. Legerro Cafe — totally gluten free Italian dining restaurant. If I had more time I definitely would have tried to eat here. Antipodea (Kew Gardens): Antipodea is a gorgeous little Australian-style restaurant, though they had fewer GF options than I had thought they would. I ordered the pumpkin and coconut soup without bread, which was delicious, a side of chili grilled halloumi and bacon. It was all delicious! One note: the risotto is not gluten free! Orangerie (at Kew Gardens): a cafeteria-style eatery at Kew Gardens, I grabbed a quick cake and tea here. I got an orange and almond cake, which was moist and delicious, and a hot cup of English Breakfast. They have a fair number of gluten free options, but cross-contamination here would likely be a risk. The Botanical (at Kew Gardens): a more upscale location, The Botanical had a number of GF options when I ate there last, including a stuffed eggplant dish that was absolutely amazing. Ask your server for gluten free options. Cellarium Cafe (at Westminster Abbey): The Cellarium offered a few gluten free options, but it was so cold when we were there that I got the soup and an order of gluten free bread. They also had a gluten free cake, which I did not try, but looked very tasty. The Privy Cafe (at Hampton Court): The Privy Cafe serves some Henry VIII-style foods, including a very impressive baked potato with cheddar cheese, which I opted for. They also had gluten free soup and a few other little gluten free bits and bobs for snacking. Henry’s Kitchen (near Hampton Court): I did not eat here, but I really wanted to! They offer gluten free bread, pasta, buns and muffins, and offer an allergen menu on request. Gourmet Burger Kitchen: GBK offered super flavorful burgers with fresh ingredients on gluten free buns. The buns themselves were not at all crumbly or fragile, and I can safely say I’ve never had a better chain burger. Would highly recommend! Wahaca: Wahaca is a chain urban mexican joint with a designated gluten-safe menu. They even break out their menu by level of intolerance, and offer gluten free tortilla chips. I believe they do use a shared fryer, so watch out for any fried foods. Ask Italian: Hands down my favorite pizza in the UK (and maybe in the world). Ask has really mastered the gluten free crust, and have awesome, quality toppings. Rossopomodoro: Rossopomodoro also has some really great gluten free Italian options, but they’re not my go-to Italian restaurant. They do offer some gluten free gnocci, which I would love to try sometime soon! Wagamama: Wagamama is a fast-Asian restaurant with a clean, modern atmosphere. They also have a gluten free menu, and will custom-prepare dishes for GF diners. I usually get the edamame and the gluten free chicken ramen. Yum! The Savoy: The Savoy hotel is one of my favorite places to get High Tea in London. Be sure to make your reservations at least a few days in advance, and tell them how many members of your party are gluten free. They do gluten free finger sandwiches, scones and mini-desserts, and I always eat way too much when I go here! I’ll be sure to update this list as I return to London and hear suggestions from fellow travelers and GF friends in the city! Last updated March 5th, 2018. One of Canada’s tastiest exports, poutine has been a favorite of mine since I was too young to safely use the stove by myself. I was first introduced to this simple-but-delicious combination of gravy, potatoes and cheese when I was at summer camp in Ontario, the savory, satisfying splendor of a hearty serving of poutine is something I haven’t been able to forget. Much to my disappointment, I learned the hard way that poutine was not served in all American restaurants. Over the years, I tried a few times to recreate the childhood comfort dish of my dreams on my own, to little avail. It seemed like I would be doomed to only enjoy poutine during those short summer months, and suffer for the other 10 months of the year without my starchy, cheesy favorite. Every time I tried to make poutine it felt like something was just wrong. Most of my attempts were made in the early days of the internet, when food blogs weren’t quite as prolific, nor were they as prescriptive as they are today. When I first became gluten intolerant, I mourned the loss of the meal that was already all-too-absent from my life, and it took me a few long, hard years to realize that I didn’t have to be poutineless for the rest of my days. After doing some research, I decided I would try and find the best gluten-free poutine substitute, because sometimes you really just need a simple, comforting classic dish from your childhood to get through the week. After many failed attempts at making the gravy to coat my coveted potato and cheese combination, I finally found a balance of ingredients that really tastes like it should. A base of butter, chicken stock, beef stock and pepper bring out the buttery, peppery flavors that make this recipe the delight that it is. This recipe can be made vegetarian with the substitution of vegetable stock for the meat-based stocks that I use below. A vegan version of this recipe can be made using a vegan cheese, like this one by the Minimalist Baker. Originally, I tried to round out my gravy after I’d made my roux with corn starch — I do not recommend this, as it will make the gravy clump in a way that’s really difficult to break up with a whisk. 1) Heat oven to 450 degrees fahrenheit. Add fries in a single layer to the baking sheet, and put into oven while you prepare your gravy. Fries will take approximately 13-17 minutes to cook. 2) Melt butter in large pan over medium heat. Add 3 tbsp of rice flour and whisk until bubbly and browned. 3) Once butter/flour roux begins to brown, add beef stock and whisk together. Whisk in chicken stock until well combined. 4) Continue to whisk together until gravy is smooth. Once gravy is thick, continue to heat through, stirring often to prevent clumping. 5) When fries have reached desired doneness, remove from oven and serve on warmed plates. Top with cheese curds, then immediately with gravy. If a little green is desired, sprinkle with fresh parsley and eat immediately. It isn’t the most beautiful dish in the world, but it is one of the most delicious!